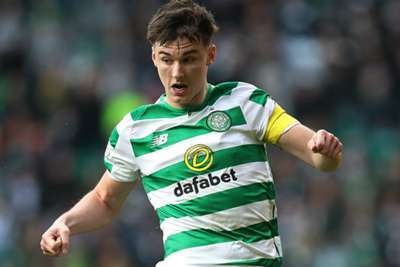 Kieran Tierney is unavailable for Scotland's opening Euro 2020 qualifier against Kazakhstan, joining Andy Robertson on the injury list, Alex McLeish has confirmed. With Robertson already ruled out of the Group I clash, Celtic star Tierney had been expected to captain the side in Astana on Thursday. Although Scotland won Nations League promotion under McLeish last year, facing Kazakhstan will be their first qualifier for a European Championship or World Cup since his second spell started and Tierney will be absent due to a groin injury. "Kieran had to pull out of this game," McLeish told a news conference. "We did a medical on him and a scan, he can't be risked at this stage. "These are things you can't control. We have great faith in our medical team and we won't take a risk with any of the clubs' players. "We don't know if Kieran will be okay for the San Marino game [on Sunday]. First things first we will focus on this game and we believe the players we have at our disposal are good enough." Alex McLeish has confirmed in his press conference that Callum McGregor will captain the team tomorrow against Kazakhstan. In the absence of both Robertson and Tierney, Celtic midfielder Callum McGregor will captain Scotland against Kazakhstan. "I think over a period of time in the last few years, Callum has shown tremendous ability on the field but also he is a very good ambassador on and off the pitch," McLeish added. "An unfussy player, nothing seems to bother him. He is a great example to the rest of the squad and I believe the players will respond to him being skipper."